Starting to sell on Amazon and don’t know if you should choose Amazon FBA or FBM? Consider yourself lucky that you are seeking answers to this question. Because it could make the difference between a few sales here and there, to turning retail arbitrage into a very viable full-time income. Fulfilled By Merchant is when you list a product on Amazon and elect to ship your products to each buyer. When you have a product(s) to list on Amazon, selecting FBM allows you to have those product listed as soon as you submit the listing. That’s because you do not have to worry about shipping the products until they sell. So, if patience isn’t your virtue, or there is an urgency requiring you to be able to sell NOW, FBM is the way to go. Although you still pay fees to Amazon when you sell a product, by handling the shipping, returns and customer service yourself you save on some cost. You just need to figure out if the cost savings is worth your time and effort. What I’m getting at, is if you are starting out and happen to buy a dog (not literally, it’s a term for a product that doesn’t sell), you can always return it to the store. That’s because with FBM you are in possession of your inventory until the product sells. So, if 2 months pass and you still haven’t made a sale, then you can easily return this product and get your money back. That said, if you’re running into that kind of issue you need to read my article, 6 Essential Factors of Viable Retail Arbitrage Products. Fulfilled By Amazon is when you list a product on Amazon and elect to ship all of your products to Amazon’s Fulfillment centers. After each product sells, Amazon picks, packs and ships your products directly to the buyer. According to a 2014 survey conducted by Amazon, “71% of FBA respondents reported that their unit sales increased on Amazon.com more than 20% since joining FBA.” I’d imagine the numbers are even higher. It’s not hard to understand that Amazon is the world’s largest shipper of goods. During the 2014 holiday season, Amazon signed up 10 million new Prime members. So that should give you a strong indication as to what type of sales Amazon is dealing with. So, when you chose FBA you are greatly benefiting from Amazon’s shipping discounts. Not to mention the fact that if you are doing this correctly, you are buying up a bunch of product and then shipping. Not just buying and shipping, buying and shipping, all in small quantities. By shipping larger quantities you can lower your shipping costs. You will quickly find out how much it can cost to ship one individual item from one side of the country to another. In fact, the first product we sold on Amazon we ended up losing $2 because we didn’t factor in the shipping component. With FBM, you are not taking advantage of Amazon’s outrageously insane shipping discounts. And the Amazon fees you save by fulfilling products yourself will rapidly deplete when you are a small shipper starting out. Going FBA automatically qualifies your listing as Prime. So you just opened yourself up to those 10 million new subscribers who paid for the benefits of Prime. If your listing is FBM, it will not qualify for Prime. As a result, buyers will not get the Free, 2-day shipping that they payed for when they signed up for their Prime membership. Therefore, you will lose sales as an FBM seller. It’s no secret that Amazon prefers giving the Buy Box to FBA listings. In fact, it will take quite a price disparity between an FBM listing and FBA listing for the FBM listing to get the Buy Box. So, if you want to get off to a fast start, dominate the Buy Box by choosing FBA. While there are multiple factors to gaining Amazon’s highly coveted Buy Box, choosing FBM will certainly hinder your odds. For example, I recently listed a product FBA for $30 above the next closest FBM seller’s price. And since I was the only FBA listing, I automatically gained the Buy Box. Oh yea, we sold that product in the same day and made $116 profit! So you can go into stores, buy 50 different products, prepare one shipment and only make one trip to the UPS store. That’s because you get to use Amazon’s warehouse to store your products. And once they are purchased, Amazon picks, packs and ships your product for you. Plus, if there is a product return, that product gets shipped back to Amazon, not you. From there they will determine if it is fulfillable, and if not, it will be sent back to you or thrown out. Last but not least, any questions a buyer may have is handled by Amazon when your product is FBA. When you make one of your rounds buying up clearance product, if you choose FBM you will hold onto this product until it sells. And if you are lacking in storage space, your product and shipping materials will likely be invading your personal space. By going FBA, you can buy your product, list everything on Amazon and ship all of it to Amazon’s FBA warehouses. So, within one day you can have your product in and out the door! 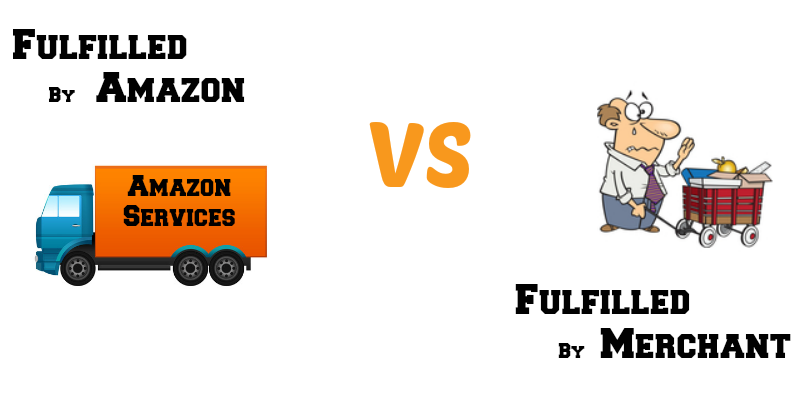 Multi-Channel Fulfillment is when you list a product on Amazon FBA, sell the same product on another eCommerce site like eBay and have Amazon ship that product to a buyer when it sells. Just another perk to add to the list. Once you are getting the hang of selling on Amazon, you should start looking at double dipping your product listing on sites like eBay, Etsy, etc. Because not everyone shopping on Amazon is shopping on eBay, and visa-verse.